As a mom to three, I often have to reach into my magical bag of tricks to find ways to make things work. My most recent struggle is getting my picky kids to eat certain meals. What they love one day, they could snub the next. It is a constant battle that I just might be winning thanks to some creativity. These PB&J Sandwich Cut-Outs are my most recent victory over the war on lunch. When I was a kid, I rarely complained about eating certain foods. I pretty much only hated liver and onions, and steak. These days, kids are so different. Their taste buds run off the visual appeal of foods. My son, for instance, will not eat anything that looks messy or unappealing. It is so bad that he will gladly go to bed hungry, and just not eat. Even a common peanut butter and jam sandwich can be a hurdle if it has crust on it. Oh, and did I mention they will only eat certain brands now? Available at Walmart, I typically buy the largest sizes of each. The summer time is one which my kids can eat peanut butter freely so we go through it quickly. Due to peanut allergies at school we have to reserve it for the weekends. But did I mention they will not eat a sandwich on whole grain bread, wheat bread, or pretty much any bread besides white? Oh, and the crust has to be removed fully. Now, I smartened up and started keeping my large cookie cutters in my kitchen drawer. 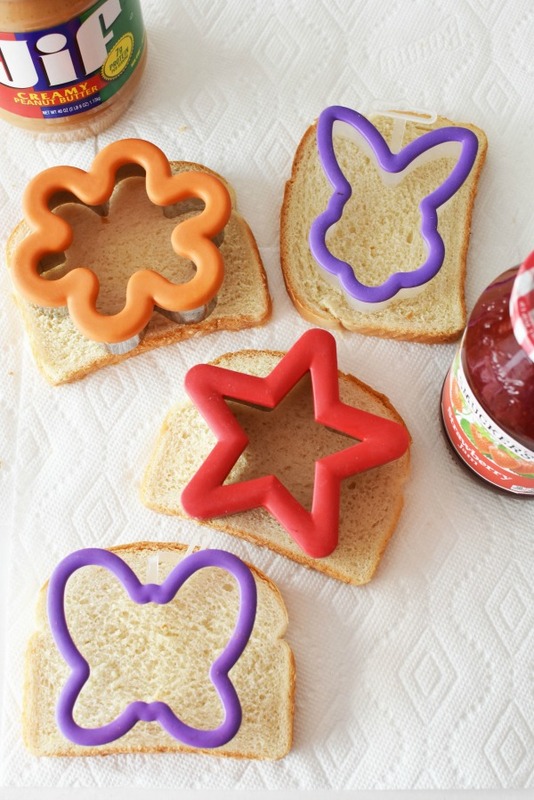 I use these on larger sliced white bread to make the cutest PB&J Sandwich Cut-Outs that are fully kid-approved. Worried about bread waste? I have been saving all that extra bread ends for things like bread crumbs and croutons. Just add them to a plastic storage container or zippered bag until you are ready to grind or season/toast them. 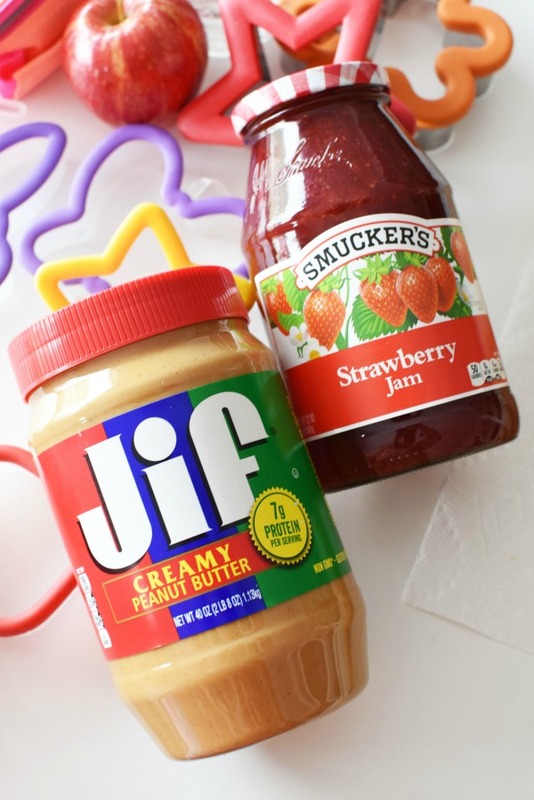 By using larger cookie cutters, you can easily spread the Jif® Creamy Peanut Butter on one side, and the delicious Smucker’s® Strawberry Jam on the other. Keep bread in the freezer and cut shapes out with semi-frozen bread. 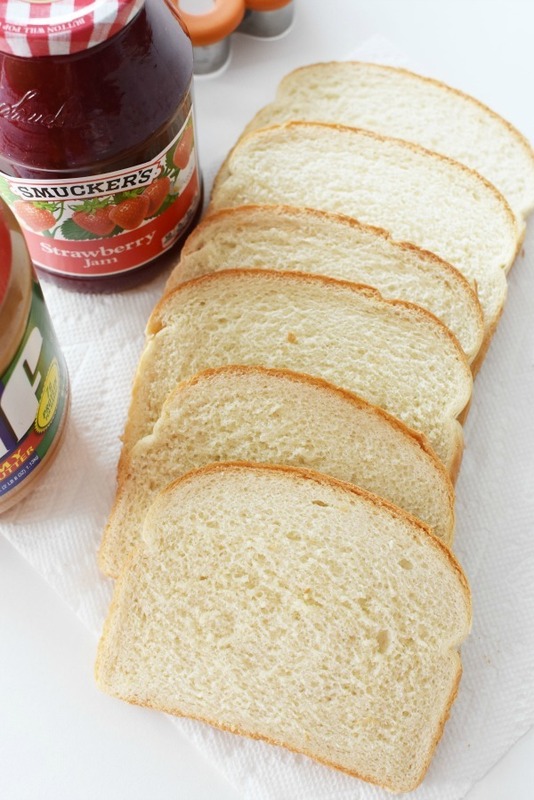 This helps to easily cut them out and spread the PB&J on them. Of course, this tip is great for back to school lunches or prepping sandwiches ahead of time. Use larger sized bread slices to easily fit your cookie cutter over. Place sandwiches in zippered bags to keep them fresh. I also use plastic sandwich containers to keep them from getting squished during back to school time. 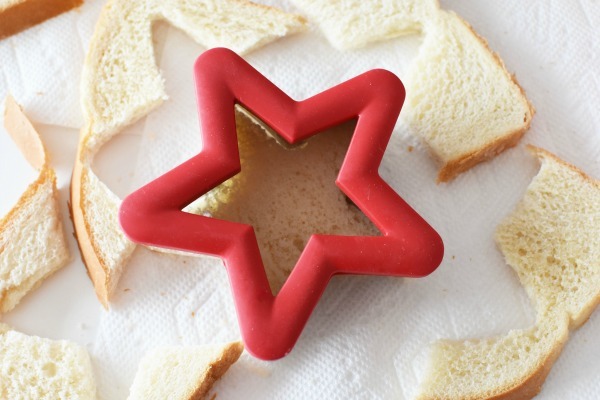 Allow kids to help cut out the shapes so they can take part in the lunch or snack festivities. 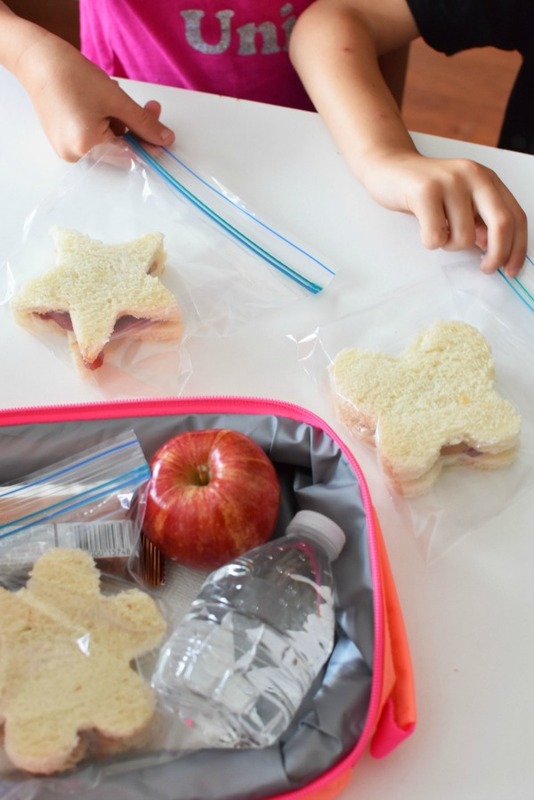 Add stickers or notes to the zippered bag to make back to school lunches extra special. With 7 grams of protein, Jif® Creamy Peanut Butter is a great lunch idea to help fuel kids and power their day and adults alike. Kids love them, they are easy to add to a zippered bag or plastic container for lunches, and they are tasty! 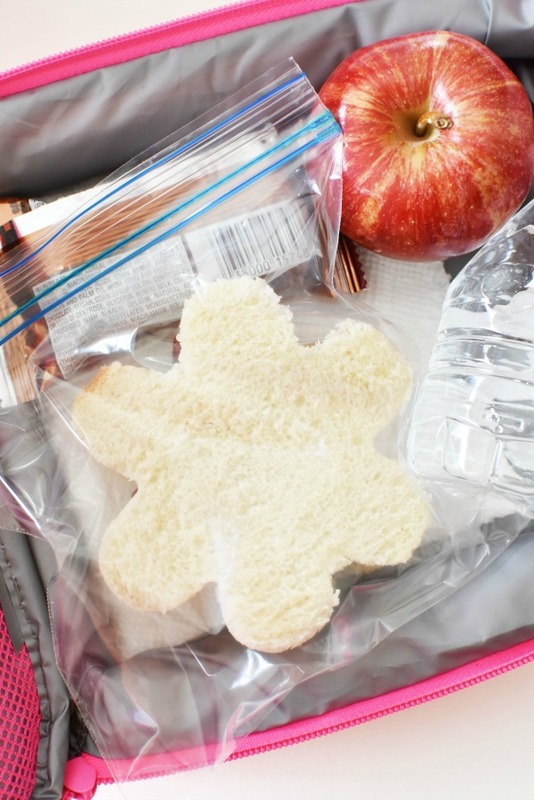 How do you make your kids lunches fun for the summer of back to school? It’s super awesome to get creative with the lunches and the snacks that parents make for the kids! I think it helps motivate them to eat more. These are really adorable! These are cute! Makes lunch fun to eat and enjoyable for the little kiddos. I use to enjoy PB&J as a kid. How fun! I guarantee you if my sandwiches looked this good, I would have probably not minded taking my own lunch to school! I can’t wait to try this with my kids! I was SUCH a picky eater as a kid. I seriously wouldn’t eat jelly! Or white bread! My mom went bananas trying to feed me. I love the little cookie cutter creations. The little sandwiches are so cute and look so fun for little ones to eat. How fun. I’m sure your kids really appreciated that special little touch. I love using cook cutters for sandwiches! You are such a great mom!!! 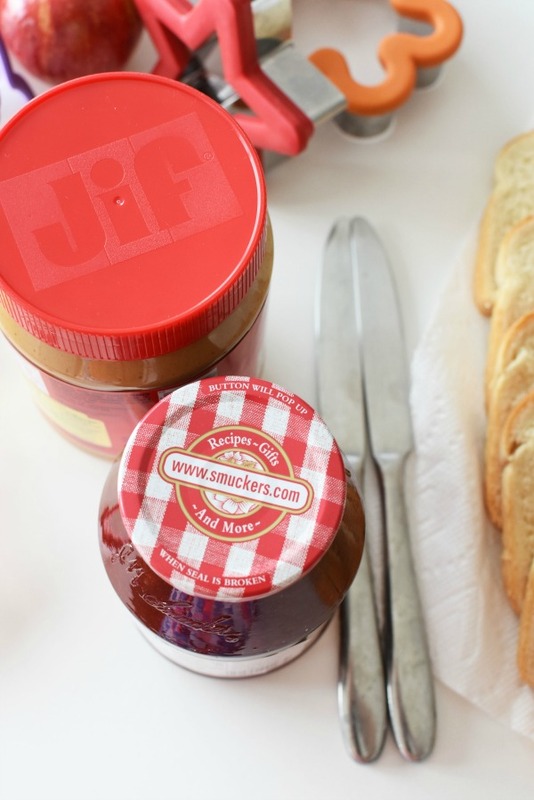 We are obsessed with jif and Smuckers at our house. I love this simple yet so creative idea of cutting them into cute shapes!!! Mom for the win! 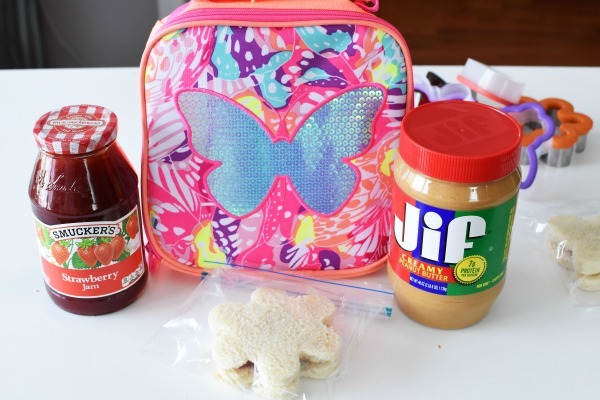 My kids love PBJ for a quick and easy lunch. They especially love when I cut out fun shapes for them. Always a surprise when they open their lunch box. My kids love eating anything that is made into cut outs. I love these PBJ brands! I love this idea. My kids wouldn’t know what to do to have these fancy of sandwiches for lunch. I’ve never been creative like this. 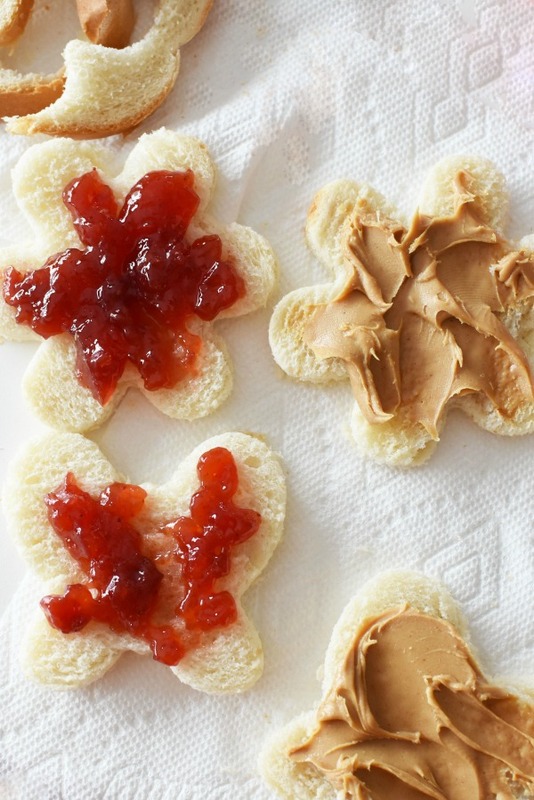 There are so cute, almost not necessary because pb&j is so good any time or any age. I’m not ready for school to start, but I really do need to start prepping. Your cut outs make a school lunch feel extra special. 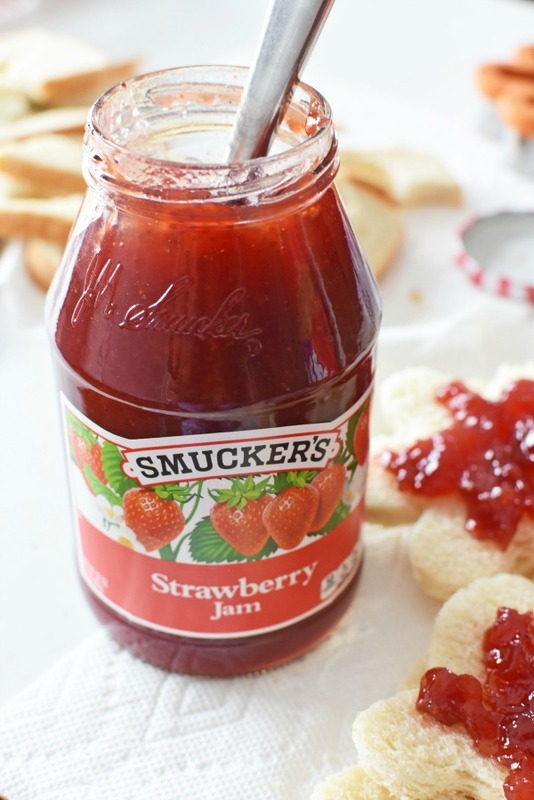 Smuckers make it extra tasty! Awe, this is so cute. My mom used to do stuff like this for my school lunches and I always thought it was so special. We are also a JIF household, although we like Extra Chunky! Hi Amy! You and your family are super duper cute. Love the energy. Thank you so much! Do you have a blog yet? I love peanut butter and jelly sandwiches! They are so yummy. And yours look absolutely amazing in those shapes who wouldn’t eat those delicious sandwiches make with love! Hats off to you, another battle won! Aw these are so cute! 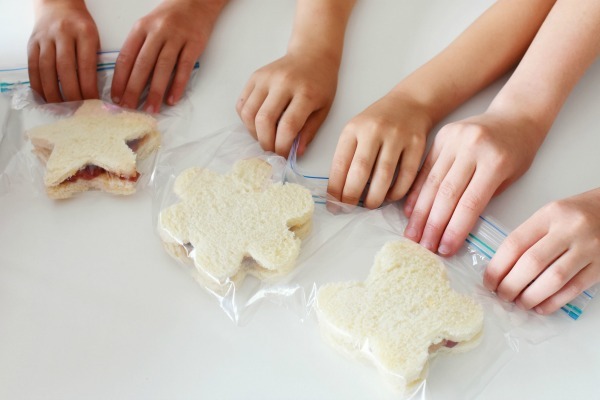 I remember when I was younger my mom would makes these awesome fun lunches for us to take to school. these are too cute love how you cut them out. These look so fun! I was never a fan of sandwiches as a child, but I feel like this would have made lunches more enjoyable.